We’ve had a fabulous few weeks on the Crowdfunder, thanks to you! We are now just 20% away from our target and well on track to reaching it! If we can continue with the incredible momentum all our supporters have created we may be able to reach our stretch funding target of £65,000! – meaning we would be able to build exhibition space in our new home, buy new boxes for our periodicals, and more! Please help us by donating now, and sharing the campaign. Excitingly we have some new large donor rewards, which could be amazing gifts!!! 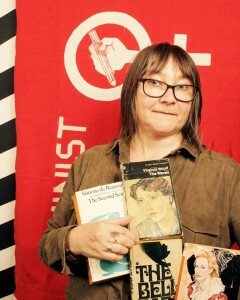 £250 will get you a full set of signed Sarah Waters novels and for £500 you can be a named character in Ali Smith’s next novel. How cool is that!!!!! To add to the excitement, we have been meeting our soon-to-be neighbours in Peckham, including a new girls football group, Girls United FC, an inspiring sewing project for empowering women, Make it Studio, Hub & Culture. We can’t wait to meet even more of you amazing people on our next trip! We have also received the first amazing draft drawings for our special edition prints (coming soon!) from Lucie Russell ofDrawing People Together. We are extremely grateful to all the amazing writers, creative organisations and individuals who have supported us by donating their time and work to help make our crowdfunding efforts a success.